Last week, we reported that Motley Crue’s popularity was soaring once again thanks to their film The Dirt. Sales of albums and streams of the band’s material have seen a dramatic increase since the film launched on Netflix last month, with downloads on Apple’s iTunes growing by 2027%. Now it’s been revealed that the Crue have entered this week’s Billboard 200 at no.10 with the soundtrack to The Dirt – their first top 10 since 2008's Saints Of Los Angeles peaked at no.4 on the chart. Billboard report that the soundtrack to The Dirt, which launched on March 22, has picked up 30,000 equivalent album units in the week ending March 28, with 15,000 of those album sales. It’s also Motley Crue’s ninth top 10, which began with Theatre Of Pain in 1985 which climbed to no.6. 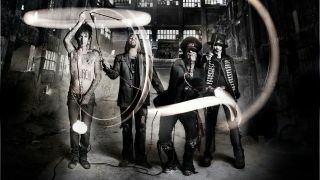 The Crue’s Vince Neil, Nikki Sixx, Tommy Lee and Mick Mars reconvened in the studio last year to lay down four new songs for the soundtrack: The Dirt (Est. 1981) featuring Machine Gun Kelly, who plays Lee in The Dirt, Ride With The Devil and Crash And Burn along with a cover of Madonna's Like A Virgin. Check out Classic Rock’s review of The Dirt.